Father. Aspiring fisherman. Basketball star. A great example of someone who has grown, matured, and learned from his mistakes, Iverson has had to overcome struggles and obstacles that most can only imagine. Raised by his hard-working mother (his father was in prison), Iverson lived in poverty his entire childhood. In his senior year of high school he went from being wooed by numerous colleges for both basketball and football, to serving time in jail and having those prospects disappear. But he persevered and went to Georgetown where he played basketball while majoring in Art. Since then he has become a basketball legend and role model – pretty amazing results for someone who to this day says football is his #1 sport. Yet with all the fame and glory, Iverson remains incredibly grounded, insisting that basketball isn’t who he is but simply what he does. Baller, artist, rebel, devoted family man – has been able to thrive as an outspoken start without ever having to compromise who he is. Favorite Song: "Unbelievable" by Notorious B.I.G. Favorite Book: "The Color Purple"
He was later granted clemency. A professional hairdresser drives from New Jersey twice a week to do Iverson's hair. Iverson only wore Jordan sneakers as a kid. Whenever they came out, his mom would do anything to get him a pair. When he was in jail, friends and family created t-shirts saying "Free Allen" or "Free Bubbachuck". During games, Iverson's mom can always be seen behind the basket with a big poster saying "That's my boy #3!" When Allen was young, he drew a life-size mural of Michael Jordan on the door. Allen Iverson is a GREAT artist. While at college, Allen and Tawanna had their first child, a girl named Tiaura. The draft summer of '96 Allen played in Japan with other college standouts and won silver medal. Iverson gave his Rookie of the year award to his mom, saying that he wouldn't have been anywhere without her. Allen is good friends with Mase, Da Brat and Jermaine Dupree. He drives a Mercedes,a Bently Azure,and a Range Rover. He has jewelry worth $300000 and a watch worth $80000. Sometimes, Allen's house gets so noisy that he checks into the closest Holiday Inn. 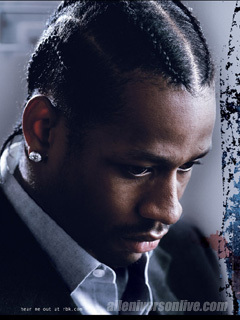 Iverson is afraid of his mother dying, and has said that he wants to go before her. He wants to have the word "Misunderstood" on his grave. His jersey is among the top 5 selling jerseys in the country. Allen's daughter, Tiaura sticks to her father like glue. She watches daddy's every move and gets grumpy if Allen even hints that he's going somewhere. Tiaura is a lot like Allen, talkative and friendly.